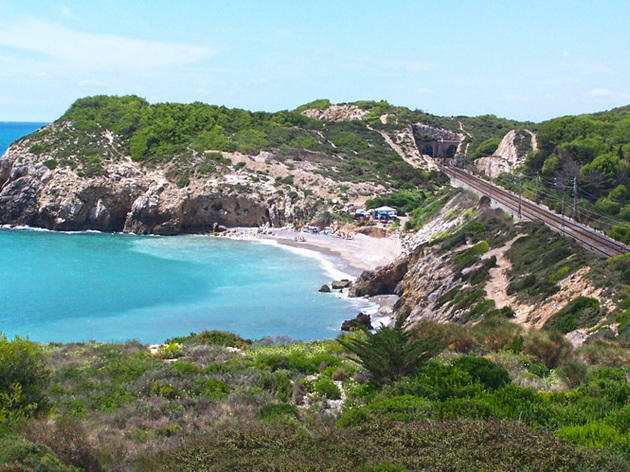 This clothing-optional beach is located in a secluded corner on the south end of Sitges, where you'll find both the Platja de l’Home Mort and the Platja de Roses. 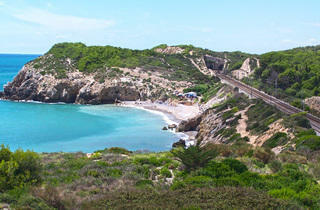 The two beaches are separated by a small rocky ravine and an open bay that draws winds to the area. The combined length of both beaches is around 300 metres but never exceeds more than 10 metres in width. The waters aren't very deep and the seabed is made up of small rocks and sand. There is a 'chiringuito' (snack bar) and a terrace, with chaise longues and umbrellas available for rent. Getting there: Take the path that begins near the nightclub Atlàntida, past the Terramar Golf Club, where there is a large parking area for vehicles. The path follows the GR-92 markers.